Advantage II Once-A-Month Topical Small Cat Flea Treatment, 6 mo., 5 to 9 lbs. Fight the misery of biting fleas with Advantage II! This convenient, easy to apply monthly topical kills fleas through contact, so they don't have to bite your cat to die. Fleas don't just make your cat itchy, they keep biting and hurting again and again. If a flea is ingested it can also cause tapeworms. Advantage II kills adult and immature stages of fleas, thereby effectively breaking the flea life cycle and preventing flea infestations. Since fleas can be brought into your home by you or other pets without even realizing it, it is important to treat indoor pets too. Remember, if your cat has fleas, you have fleas! Advantage II isn't just great for cats! 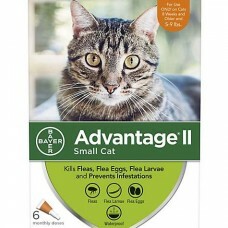 Advantage II Flea Treatment for small cat 5-9 lbs. is also registered for use on ferrets 10 weeks of age or older, weighing 1 lb. or greater. Not for use on humans.